In the second book of the young-to-mature-adult fantasy series The Lutona Chronicles, author and artist B.A.Klemetti creates a different kind of fanciful world on which the challenges continue. 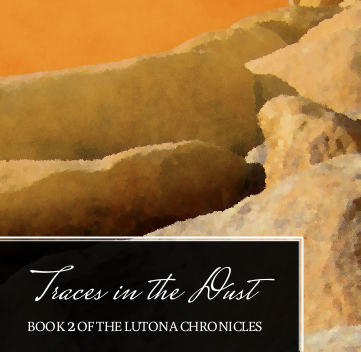 The second book of The Lutona Chronicles is Traces in the Dust. Convinced that the adventurous part of his life is over, Kris has returned to his family, his friends, and his high school classes, inwardly enriched by his friendship with Lucienna and the secret challenges he faced on Lutona. Imagine his shock when Lucienna shows up again, in a new disguise that no one but Kris seems to question. Kris soon learns that Lucienna is determined to pursue and retrieve the stolen jaguars, using whatever means possible, including Kris's special talent. For that purpose, Kris, a new friend Mariu, and an extremely unwilling team member travel to the desolate planet of Zeoterron where they face otherworldly and dangerous inhabitants in a setting devastated by past development. How they manage to survive on the planet as they attempt to succeed at the formidable task is an amazing story of cooperation, courage, and invention, as well as willingness to learn about oneself and others.